Earlier this year we had a bit of a revelation. It came from our Zambia Program Manager, Olivia Bell, who had been digging into the Demographic and Health Surveys (DHS) statistics. 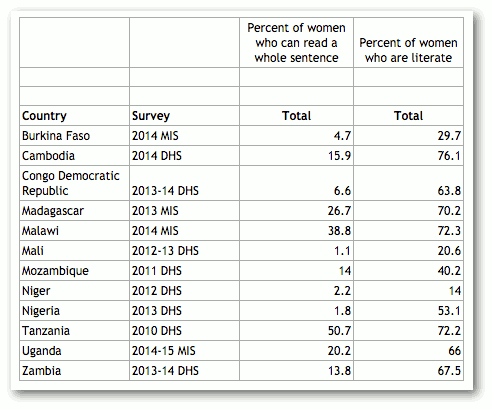 In our presentations, we typically use the stat “percent of women who are literate,” but I think the more illustrative statistic in our countries is “percent of women who can read a whole sentence.” Check out the table below. 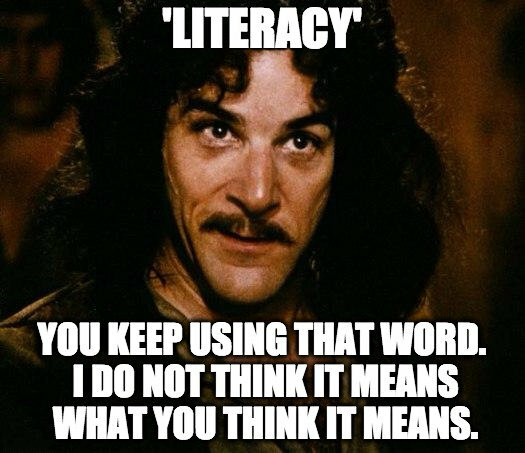 Many proponents and purveyors Behavior Change Communication (BCC) campaigns have likely interpreted literacy statistics as generously as we had, prior to our revelation. And in doing so, they fall short of effectively reaching their intended audiences with text-based information: posters, pamphlets, billboards, SMS, USSD, etc. The heart of HNI’s 3‑2‑1 Service is a Interactive Voice Response (IVR) system from VOTO Mobile. The service is designed to allow people to access local language, pre-recorded messages. 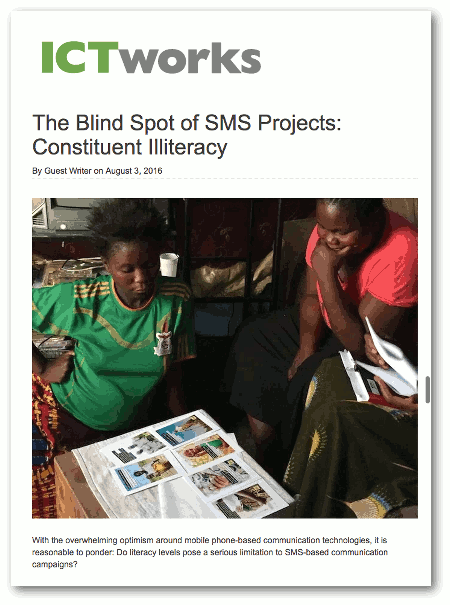 The SMS and USSD channels, which require more meaningful literacy are, in a sense, a bonus feature of the platform. We use this IVR system for other projects as well; projects where voice recordings and voice prompts have a clear advantage. Our partners are NGOs, Ministries, private sector companies, and other organizations who want to reach constituencies with life-enhancing information on many topics: Health, Education, Gender Equality, WASH, Climate, Agriculture, Governance, etc. We occasionally find ourselves in the awkward position of pushing back against a partner, in the throes of SMS fever. There they are, checkbook in hand, and asking us to do a straight-up SMS project. And we say, Not so fast. These partners are very attracted to the low cost and the potential reach of SMS projects. Yes, with SMS you can reach the mobile phones of thousands of people for a fraction of the cost of doing the same by IVR. But reaching their phones is not the end goal. The end goal is reaching people with information they can understand and use. Recently a partner wanted to replicate in Nigeria an SMS project that had been somewhat successful in Ghana. The literacy rates in Nigeria are completely different, given that 54 percent of rural women here and 40 percent of rural men have no formal education. When you dig into that statistic further, only 1.8 percent of Nigerian women are deemed capable of reading a complex sentence. I think it often stems from trying to emulate programs elsewhere, and not thinking about the Nigerian context. I pointed out that I thought SMS was a waste of time in Nigeria. With 3‑2‑1 we are really expecting phone calls; we don’t really expect many people to use the SMS or USSD channels. It comes down to money. I think deep down that people know. People often talk themselves into believing that SMS or USSD will work. Another HNI project in the Democratic Republic of Congo, began with the intention to register family planning clients using SMS with our DataWinners data collection platform. After considering the literacy levels of the health care workers, we switched to a system where clients will be registered by IVR instead. We weighed the efficacy of IVR against the additional cost. “It was very difficult to get the budget down,” said Whitney Wilding Hughes, our Program Manager in the DRC. In the end, however, our partner will spend less time and fewer resources training the workers to use the IVR system. We expect that IVR will also improve the compliance rate of the workers using the system. 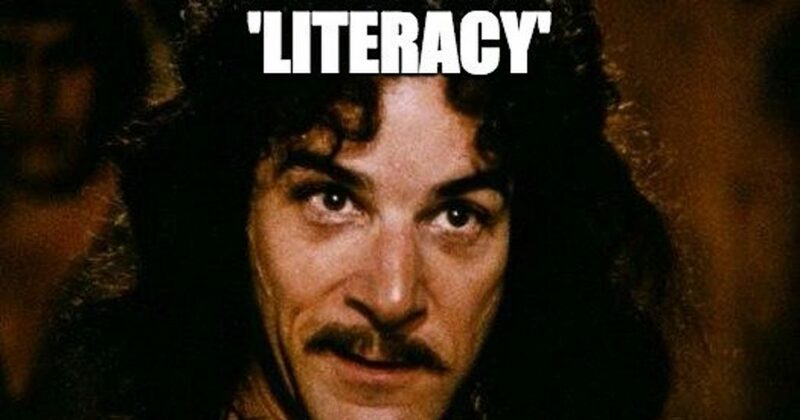 A deeper understanding of DHS literacy statistics bolsters what we already experience on the ground. We do user testing, and involve the human perspective in every aspect of project design. “Human” is right there in our name. And when SMS makes the most sense, we have the tools, skills, and experience to do it right.